Polka dots are a fun pattern you should definitely add to your wardrobe. This rounded pattern is taking the stage every year and can be part of your more classy and elegant outfits, as well as of the retro vintage and preppy ones. It goes well with almost everything so you won’t find it difficult to combine it. Below, we have chosen several street style looks to show you how you can wear dots in the most fashionable way. Check them out and do not hesitate to add this playful and fun pattern to your wardrobe. Enjoy! The easiest way of styling polka dots is to go for a polka dot dress. Depending on the type of dress, you can wear it at the office, for a night out or for some casual day meetings. Combine your dress with a pair of heels, flats or maybe even sneakers, if it is a more casual one. Skirts are the must-have items for this time of the year. They can be found in various styles, colors and patterns, so you will for sure find some dotted skirt too. Combine it with some neutral top and a pair of heels, add some accessories to spice up your look and you are ready to go. Another way to wear dots is y getting yourself some stylish dotted top. Pair it with some jeans, pants, skirts, shorts or maybe even some overalls and make a statement this summer. 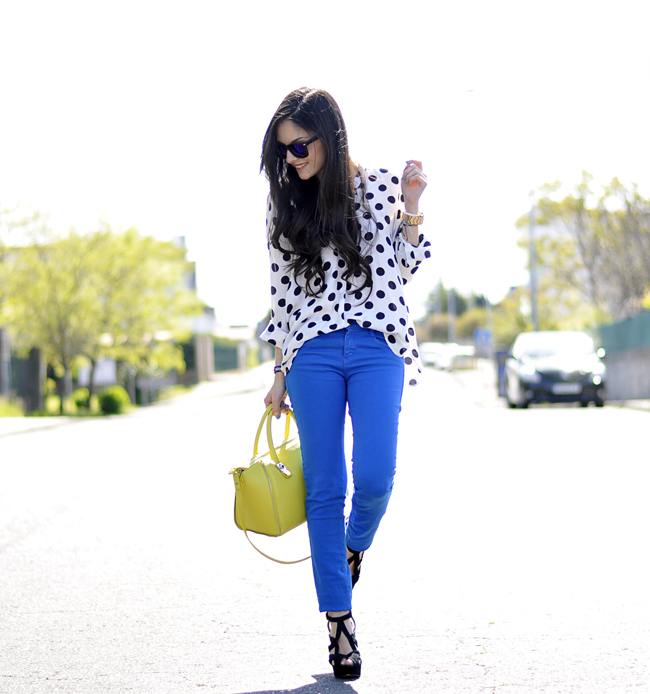 Here are some street style looks with polka dot tops that you may find as an inspiration. There can be found many polka dot pants, so that is one more way of making dots part of your outfit combos. Choose whether you will go for the most common color combo, the black and white, or maybe you will make a statement with some other one. And if by any chance, you don’t feel like ready enough to pull off this fun polka dot trend, then at least try to add some polka dot accessories. For instance, an all black outfit can be spiced up with some fancy black and white polka dot bag, like the one on the picture below. Now that you are familiar with the many ways of making polka dots part of your outfit combinations, we hope that you will add this fun and trendy pattern to your wardrobe. Thank you for reading and don’t forget to stay up to date with our content to keep up with the latest fashion and beauty trends.